Note – all references to banjo parts are likely to be incorrect, because I know absolutely nothing about banjos. Kindly just nod and pretend that I know what I’m talking about. There’s an antique store that we walk past on our work commute named Antelope Antiques & Coins. It’s in a basement space with a ground level window display. A fascinating array of objects rotate through this display: ventriloquist dummies, comic books, native carvings, typewriters, and everything that someone might once have loved. Antique stores delight me with their odd wares and the occasional spark of joy that signals me take something home — after paying for it, of course. The stores also sadden me, so I don’t actually go in very often. A lot of the merchandise comes from estate sales, which makes the shops a sort of ossuary for the scattered belongings of the dead. In that vein though the remains have the potential to revive as part of a new life, so I suppose that it’s a bit less gruesome than I tend to imagine. It’s certainly less ghoulish than pawn shops, which trade in the fallen dreams of the living. What I mean to say is that it takes something special to make me descend those stairs and poke around amongst the artifacts. One evening last week, Wendi and I went down those stairs and came out with an 80-year-old banjo, give or take a decade. 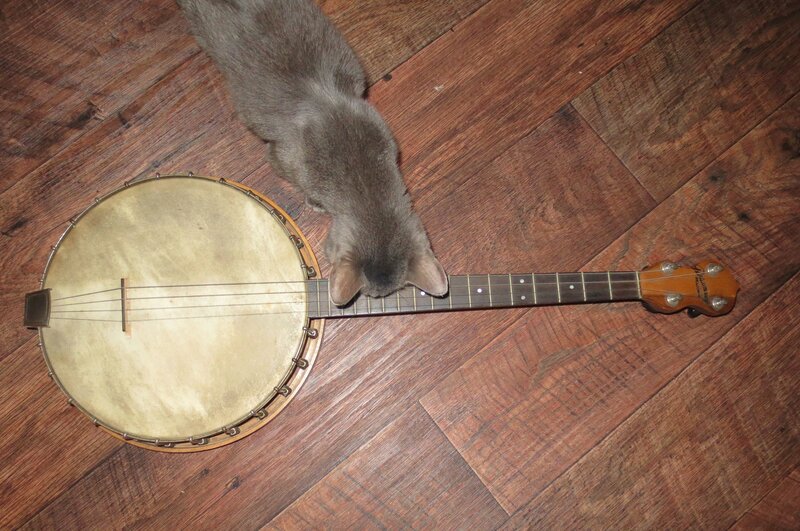 Ling helps inspect the banjo. She notes that the distance between strings and frets grows alarmingly as the neck of the instrument approaches the body. I don’t know which of us saw it in the display first. I noticed it but didn’t say anything. My birthday is approaching, and I’ve made a habit recently of discovering stringed instruments and convincing Wendi to count them as presents for upcoming events. This deprives her of the fun of looking for gifts, and it crowds my studio even further. And anyhow I focussed on ukes and mandos, which this was not. Wendi exclaimed over the banjo, and we stopped to look at it. It was cool, but it was not on my list. Then she pointed out that it had only four strings. My greedy little eyes lit up. Four strings? Could this be a banjolele, a uke with the body of banjo? My resistance shattered, I readily agreed to go take a closer look. A saleswoman fetched it from the window for me, and I started to inspect it. The neck was out of alignment, and the body cover looked dirty with age, but other than that it looked okay. I plucked a few strings and heard the sound bounce between the cover and the wooden back. That did it. I needed this 4-string banjo. The resonating back of the banjo. Once I got home I poked around on the internet to see if I could identify it. Still convinced it was a banjolele, it took a while for me to modify the searches enough to make any progress. The head had the word ‘Paramount’ etched off-center on it, and by focussing on that and ‘banjo’ with ‘4 strings’ I started get somewhere. Unfortunately I wound up on seemingly divergent paths. 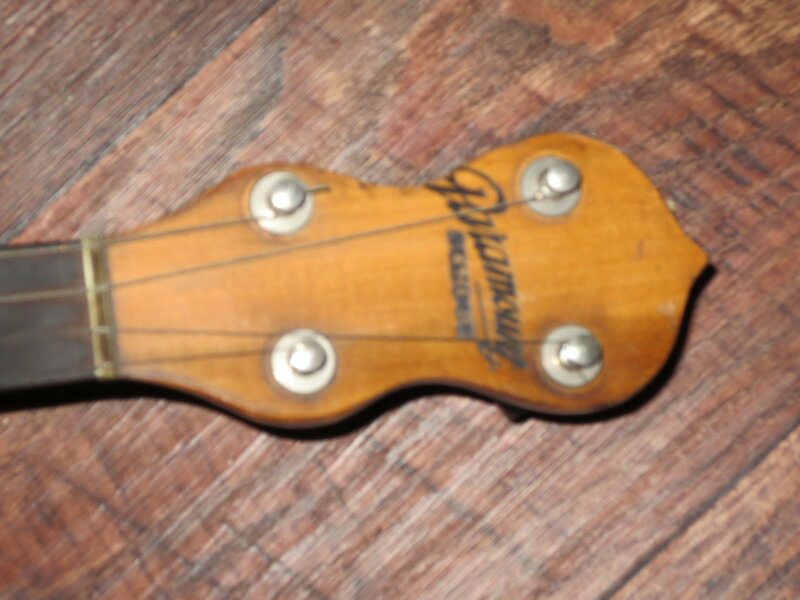 There was a company called ‘Paramount’ that made banjos around the 1920s. There’s conflicting information about whether it started then or was an earlier company that had started in the 1890s under a different name. In either event, they put out 4-string tenor banjos with the ‘Paramount’ imprint for around 15 years in the period between the World Wars. The few pictures that I found didn’t match up, though. Then I stumbled on a reference to “Paramount School” 4-string tenors. This was apparently a mail-order music lesson company that distributed banjos — although through sale, rental, or free with curriculum is unclear to me. Also unclear to me is how or if this is related to the instrument company. Paramount seems to be a respected brand, but Paramount School is dismissed as inferior. What I do know is that the smudged letters underneath “Paramount” can be read as “SCHOOL”. I also know that I love the sound it makes and the mystery of its former life. 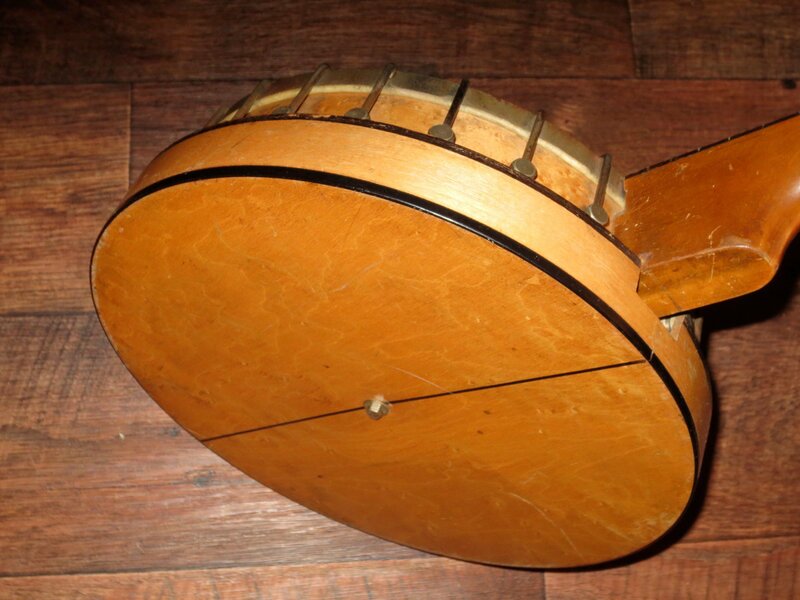 Whatever its origin, this instrument has been kicking around for about 90 years. Was it played at gatherings? As part of an informal band? Or did its owners pick at it a little bit and give up? Now it’s part of my motley collection. It’ll get a little TLC, and every so often I’ll ask it to teach me a little more about itself. This entry was posted in Life as a Zombie and tagged antique, banjo, shopping by retrozombi. Bookmark the permalink. I have a very similar tenor banjo that belonged to my late father-in-law. The resonator is birdseye maple, as yours appears to be, but has no stripe on the back. The word School has been scratched through to the bare wood and until this article I didn’t know what had been there . I thought someone didn’t like what was there and intentionally scratched it out because it went under the 1st string, not likely to have happened by accident. I haven’t tightened up the leather head for fear of breaking it but I’m sure it would improve the tone. The tuning keys are very sensitive making it a little difficult to tune. I play a 5 string a little and have a homeade banjo, a very cheaply made “seed banjo” that was earned by selling seeds for a company through comic book or magazine ads and another cheap banjo. I just traded for a Gibson Mastertone, Earl Scruggs, banjo, I have wanted a Mastertone since I was 15 years old. Thank you for this article, now I know what this banjo is.